With conditions near perfect for the event. We were anxious that there might not be any snow at all, and when we got to Trexler Friday night there was precious little. The Camp had received all the rain that we did the week before, on frozen ground, and the whole camp was dangerously iced over. It took quite some maneuvering to get our vehicles back up the rutty (road?) into the outpost campsite that we love so much. BUT we did! And as we were setting up camp in the beautiful mountain laurel the snow began to fall. Tucked into our cardboard, foam and high‐tech Dupont fiber cocoons, with a belly full of Mr. Maier’s famous hearty Klondike Goulash, our Scouts slept well and were ready to put in fine performances all around. By race time 6 inches of snow was packing down over the icy trails making for great sledding, and the daytime high temp hovered around freezing, preventing the dreaded mud festival. Screamin’ Eagles carried a big legacy and, with huge expectations on them – did not disappoint! Well done Lads! 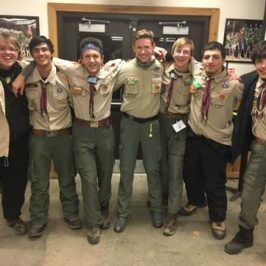 Troop… 3 weeks ago! Welcome aboard! … I’m feeling’ preeeeety good already about the odds for next year! them more than 100 points at the Scout Spirit Station ‐ How Cool is that?! So! the NEW RECORDs : 9th year in a row 236 has taken a podium position 7th time (in 9 years) 236 has put 2 teams in the top 15, 6th time (in 9 years) 236 has put 3 Teams in the top 15. There were 470 participants this year – roughly 420 Scouts and 50 Scouters. 31 Teams competed for the gold. That’s a few less sleds than average, but with bigger teams. Blame the weather? We were one of only two troops to field three sleds … the other Troop – not a contender. Our Long Valley brothers however made a good show of it. T436 raced two sleds, placing 11th and 21st and Troop 36 into the top 20 with two sleds finishing 18th and 20th ! 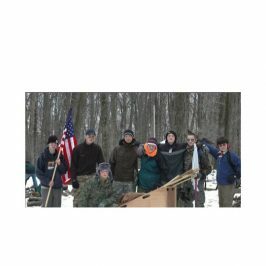 Special thanks to the OLD HUSKIES, INCLUDING ; quartermaster to the stars‐ ERIC DEGEN, Frontier Chef and the guy who heard the tarp go down at 4 AM (12°F and snowing) and got up, secured the camp kitchen and had hot coffee and breakfast ready at 6 AM – ROB MAIER!! The guy who pulled that fine looking (thanks Tony!) new Troop Trailer as part of team GMC Yukon with an also fine looking sled on the roof‐ PETE LONGO!, Returning celebrity guest stars ALBERTO GARZA and DAVE CLARK, and, on his first arctic expedition ‐KEVIN MULLIN!